This Single Gas Tap is the perfect gas installation component for use in any gas system in your caravan, motorhome, or campervan. This 2 Way Gas Manifold is the perfect gas installation component for use in any gas system in your caravan, motorhome, or campervan. This 3 Way Gas Manifold is the perfect gas installation component for use in any gas system in your caravan, motorhome, or campervan. 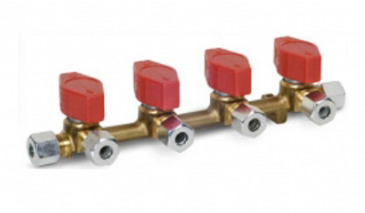 This 4 Way Gas Manifold is the perfect gas installation component for use in any gas system in your caravan, motorhome, or campervan.